America&#x2014;A Destiny Unveiled reveals fresh insights concerning America&#x2019;s destiny and the secret to her greatness. 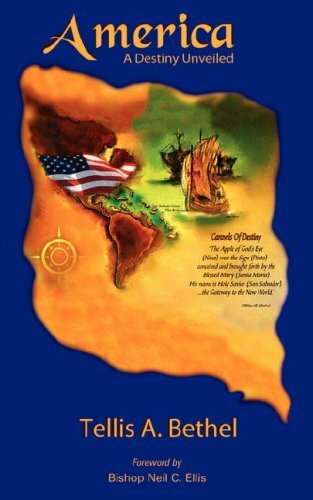 This enlightening book takes its readers on a voyage of discovery from Christopher Columbus&#x2019; first landfall in the Americas on a tiny island in The Bahamas to &#x201c;America&#x2019;s war on terrorism.&#x201d; The mysterious clues uncovered throughout this unusual journey help unravel a &#x201c;bigger picture&#x201d; concerning: &middot; The &#x201c;hidden mystery&#x201d; behind the arrival of early European explorers in the Americas. &middot; The impact of the tiny islands of The Bahamas on America&#x2019;s destiny. &middot; A divine purpose for the United States of America. &middot; Humanity&#x2019;s long-sought Pathway to Paradise. &middot; The spiritual significance of current world events. &#x201c;Tellis Bethel in this work provides an intriguing perspective ... that stretches the boundaries of our concepts of national meaning.&#x201d; &#x2014;Dr. Myles Munroe TELLIS A. BETHEL was born in Nassau, New Providence, in the islands of The Bahamas. He and his wife, Teri, are members of Mount Tabor Full Gospel Baptist Church, where the senior pastor is Bishop Neil C. Ellis. Tellis has also served under the leadership of Dr. Myles Munroe as a former associate pastor and youth director at Bahamas Faith Ministries Fellowship in Nassau, Bahamas. Tellis is a graduate of the Britannia Royal Naval College, Devon, England, and the United States Naval Staff College at the U.S. Naval War College in Newport, Rhode Island. He is also a Fellow at the Center for Hemispheric Defense Studies at the National Defense University in Washington, D.C. Tellis currently serves as a naval officer in the Royal Bahamas Defense Force and resides in Nassau with his wife and their two sons.